Available from Castlegate James , Citrus Pulp is a valuable co-product derived from the processing of oranges for juice that is ideal for use as an economic, high fibre stockfeed for healthy rumen function. Once oranges have been processed for juice, 45% - 60% of the original weight remains in the form of peel, pulp and seeds. This pulp is a good source of calcium, but low in phosphorus. Citrus Pulp high fibre stockfeedsupplies highly fermentable neutral detergent soluble fibre (NDSF) and sugar based energy forms, providing a high energy feed without the acid burden associated with high energy starch based grains. It also complements heat stressed pasture by supplying rapidly available fibre and sugar based energy forms, which degrade at a similar rate to pasture nitrogen, thereby optimising rumen efficiency. As Citrus Pulp ferments, there is no acid production which creates better rumen conditions for fibre fermentation, complementing pasture based feeding. NDSF is a highly digestible fibre form, which rapidly ferments in the rumen without the production of acid, thereby supporting acetate production and promoting milk fat synthesis. 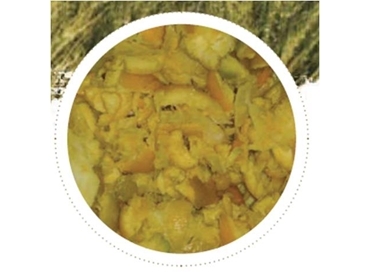 Citrus Pulp is also considered a highly valuable inclusion with forage silage as it increases energy content and provides a desirable medium for bacterial fermentation. With a sweet taste and aroma, Citrus Pulp high fibre feed acts as appetite stimulant assisting high dry matter intakes (DMI) during times of heat stress. This product has been processed to provide a consistent uniform pulp, enabling the citrus to be blended throughout the ration to prevent sorting. Citrus Pulp should be fed at a rate of up to 12.5kg fresh or approximately 2.25kg on a DM basis. Citrus Pulp silage has a much higher weight per volume than that of grass or maize silage and therefore silage pits in which it is to be placed should be more strongly reinforced. Citrus Pulp high fibre stockfeed is available in bulk.